Some things never change at the Thames. When the streets were surveyed in late 1867, the plans appeared in the most part very easy to follow, with the majority of streets running in simple grid like pattern. Part of 1868 Miners Illustrated Map of the Thames Goldfield. Rolleston Street and Karaka Road intersect, centre left. One of the more unusual layouts centred around Karaka Road and the connection to Rolleston Street. Over decades realignment happened on several streets, but this was one where houses had been built on plots that limited corrections to the road. The 1889 Alignment Survey highlighted many problems around the town. The north end of Rolleston Street, had the challenges of two triangular shaped pieces of land - to the west with Baillie Street and to the east with Karaka Road. The Post Office Hotel, tackled the problem by building a structure to fit the land at the corner of Baillie (Court), Mary and Rolleston Streets. On the Karaka Road side (where the Nurses' Home sits today), the site was filled with a boarding house, hall and a residence. In the 1902 Cleave's Directory the listings were: Commercial Boarding House (Foy's), Protestant Alliance Hall and 'probably' the house of John Wade (miner). On the right side of Rolleston Street, from the Mary Street intersect were: The Post Office Hotel (Morrison's), William Deeble (Grocer), Archibald Currie (Bootmaker), W H Smith (Miner), R Hill (Baker), Mrs Schmidt (School teacher), Mr Egginton (Telegraphist), T Taylor (Fisherman), William Hosking (Grocer), Mrs Simpson, F W Keller (Stationer), and on the Sealey Street intersect R Bateman's butcher shop. Today, the sharp bend into Rolleston Street remains, as it did in the 1900s photograph below. Above: c1900s View down Karaka Road to the intersection with Rolleston Street. 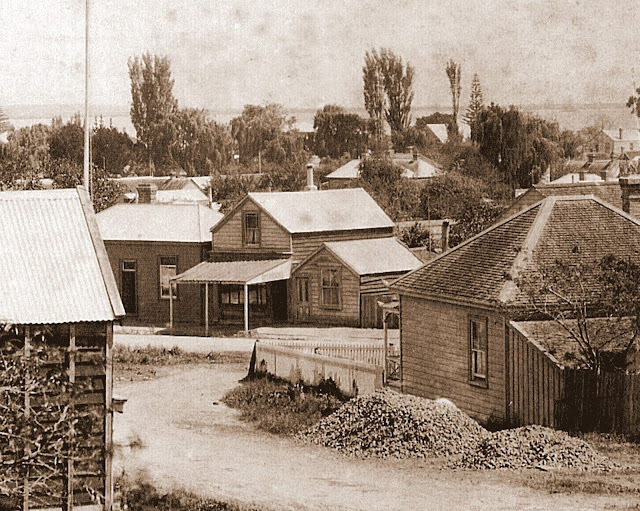 Below: a closer look at the 1900s view of the Karaka Road and Rolleston Street intersect. Today the Rolleston Street side is where the Thames Medical Centre is located.